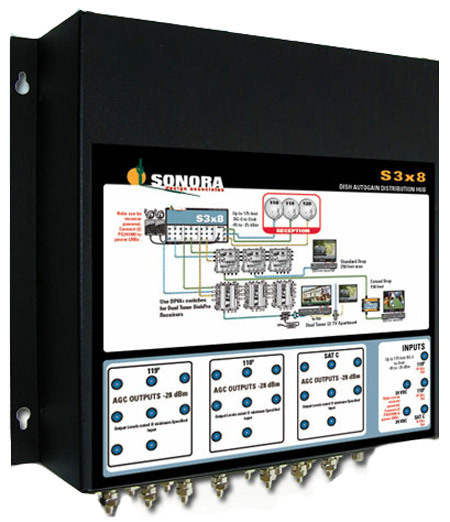 SONORA distribution hubs amplify multiple DBS signals using automatic gain control so one set of dishes feed multiple apartments. Three satellite hubs are illustrated for use with DISH 110ÃƒÃ‚Âº , 119ÃƒÃ‚Âº and 129ÃƒÃ‚Âº signals. This is the most common application. They can be used to split (3) 250 to 2150 MHz DBS inputs to multiple outputs. Multiple satellite hubs are available for one, three and fi ve coax inputs (models S1x6, S1x8, S1x12, S1x16, S1x24, S1x32, S2x3, S2x6, S2x8 -amp; S5x8).